Enjoy a relaxed and memorable afternoon of tea and mouth-watering delicacies at Carnegie Hall Guild’s third annual fundraising tea, “How Sweet It Is,” Friday, September 24, 2010, at 2 p.m. at Blackwell’s Restaurant in Lewisburg, WV. 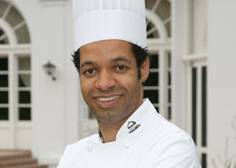 The Guild is delighted to announce its special guest will be Thierry DeLourneaux, Executive Pastry Chef at The Greenbrier Resort. Chef DeLourneaux will present a “Fruits de Pate” and culinary dessert presentation. Keeping with tradition, each table will be individually set, featuring each hostess’s own crystal, china, flatware, and decoration, creating a unique and personal ambiance. Blackwell’s and Chef DeLourneaux will provide guests with petite sandwiches, scones with clotted cream, desserts, champagne, and tea. Admission is $50 per person. Reservations are preferred and can be made by calling Elizabeth Isaac at 304-520-4055. Chef Delourneaux's training has taken him from France to New York, Toronto to California and has included Executive Pastry Chef positions at the Forbes Five Star, AAA Five-Diamond Grand Del Mar in San Diego, as well as Ritz Carlton Tyson's Corner and the world famous Beverly Hilton. Funds raised from this year’s tea will once again help underwrite the Communities LinkUP! concert, a music education and performance program for Greenbrier County 4th graders. Carnegie Hall Guild’s mission is to promote interest in Carnegie Hall, provide financial and volunteer support, and address special needs and occasions not addressed by the Carnegie Hall budget or its volunteers.